The red marks are demon lord statue locations. The marsh to the west is very unsafe, full of Skavens worshipping Slaners. The lake to the east is not safe. There are squid-skulls mutated by the presence of Cthulhu, lurking about. The railroad tunnel project south-east of town accidentally broke through a wall to an old Nurgle temple. It was quickly sealed off and the tunnel is mostly safe again, if you disregard those workers slowly turning yellow and undead. South-west of town, up in the mountains, some berserker dwarves are excavating out a old statue of Khorne. All who approach the place also go berserk. Sixton is a murky town in a dark world. 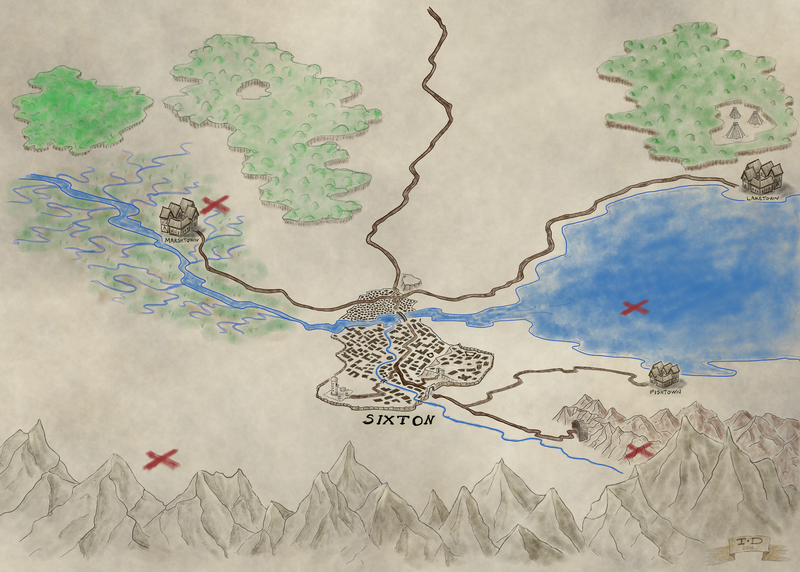 But we were in need of a map for our weekly Shadow of the Demon Lord campaign, so I drew one. I used my new and shiny iPad Pro + Pencil for this project, so if you want the map without the red marks, it’s easy to fix. Let me know and I’ll whip up a new version.